The Cheesecake Factory Deal: Two Free Slices of Cheesecake with $25 eGift Card Purchase. Each slice is around $7 so it is about a $14 free value with the purchase. Free Cheesecakes slices are Redeemable on a future visit valid 1/1/2019 - 3/31/2019. Only one eSlice of Joy Card may be redeemed per guest, per visit. Must Purchase before midnight on 12/20 Monday Night! 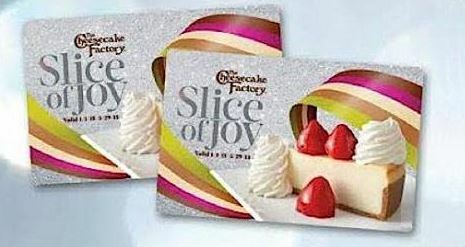 Terms: For every $25 in electronic Gift Cards purchased online from https://shop.thecheesecakefactory.com/ in a single transaction the purchaser will receive two electronic Slice of Joy Cards (each, an ""eSlice of Joy Card""). Slice of Joy card redeemable on a future visit from 1/1/2019 - 3/31/2019 for one complimentary slice of cheesecake or layer cake. One card per guest. Must be present to redeem. Valid in the United States and Puerto Rico only.